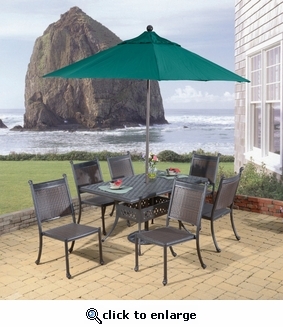 Combining our stylish cast aluminum with our high quality "All Weather" wicker makes this set perfect for any settings. Our Bronze finished Cast Aluminum frame is easy to care for with vinyl/resin double woven seat and back for optimal comfort. This cushionless set is comfortable and easy to care for. Table comes with umbrella hole and removable cover.